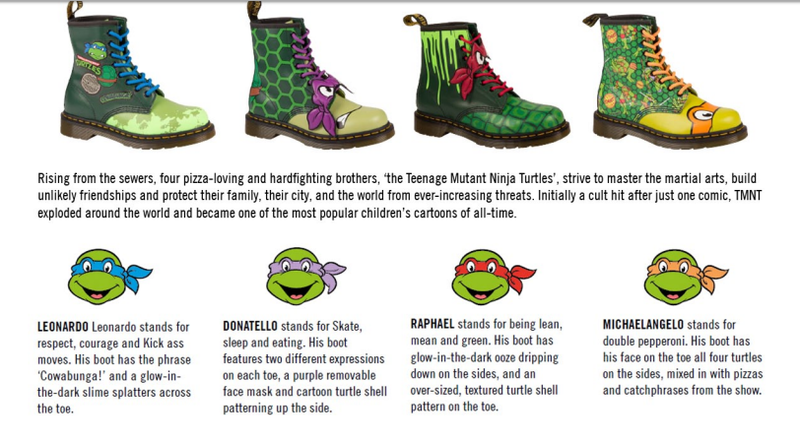 Doc Martens teams up with Nickelodeon for their AW16 collection by four unique Teenage Mutant Ninja Turtles signature boots featuring everybody’s heroes-in-a-half-shell (turtle power). If you live under a rock (or sewer) this collection is based specifically on the 1987 cartoon series which made the TMNT such a huge hit back in the day. We’ve got the leader Leonardo in blue, Donatello the inventor, Raphael the tough guy and Michaelangelo the party dude. Here’s the breakdown and a look at these AWESOME boots! I actually took the boots for a spin a number of times, even posted it on my personal instagram account. It feels great on your feet and its durable, definitely protects you from whatever the hell is out in Metro Manila streets. Manila’s a sordid place some times and wearing a good pair of shoes (or boots) can be a good thing. Never had “ngawit” too which is surprising considering how big they look. It’s just a bonus that we’ve got the Teenage Mutant Ninja Turtles hanging around the design. They did such a wonderful promotion for this, there’s even a cosplayer who came to APCC dressed as Raphael wearing boots. To know more about Dr. Martens please visit www.drmartens.com and www.facebook.com/drmartensph. Or check out the following social media handle and hashtag @drmartensph #standforsomething. Visit the all-new Dr. Martens stores at Dr Martens Glorietta, G/F Glorietta, Makati City; Dr Martens SM The Block, 3/F SM City North Edsa – The Block, North Ave. cor EDSA, Quezon City; Dr Martens SM Megamall, 3/F SM City Megamall – Bldg. D EDSA cor J. Vargas Ave. Mandaluyong City. Dr. Martens is exclusively distributed in the Philippines by the Primer Group of Companies – Asia’s Next Retail Giant. Stranger Things Season 2 Production Officially Begins!